Would it be possible for a nation with 19th century to very early 20th century technology and history and hot desert climate to utilize solar power for electrical generation as a substitute for coal or replace the use of coal in any other way? There is not an abundance of national coal, however, rivers and ocean could allow for importation of coal. You can offset the economy problem by making coal hard-to-get in your country. However, the second problem remains: Efficiency. Early steam engines were brutally inefficient, turning only 1% or 2% (Watt's optimized version!) of the heat into actual mechanical work. So, if you have a giant 10x10 m mirror ($100\ m^2$), you only get 1 kW or 2 kW of usable power output. Anything that requires more energy than that quickly becomes infeasible to power with the many, enormous mirrors you need, which all require man-power to adjust to the sun continuously. Of course, you can offset this by a) allowing close to modern steam turbines, and b) fancy clockworks that automagically adjust the mirrors. Nevertheless, it remains difficult to get the power from the power plants to where it's actually needed. If they have a lot of desert space, perhaps they could build solar updrift towers? It's basically a large area covered by a greenhouse roof and a high chimney in the middle. The energy output is proportional to the area times the chimney height. They were invented in 1896, so they use only technology available at that time. You can run a generator on an open-cycle hot air engine. This is a heat engine that gets energy from the expansion of air when it heats up. The major issue is getting cold intake air. You can use a ground-coupled heat exchanger for that. Specifically a thermal labyrinth. The air is drawn thru a long path underground and cools in the process, basically. Heating up the air is depressingly simple in a desert. Just have some some structure made of metal above ground where sun can shine on it and it can change heat with the local air. If you have mirrors you can focus the sunlight for much higher temperatures. Solar cooking ovens are a thing so the mirror and design wouldn't need to be that good. For a more serious design you can use a parabolic through. For the viability of all this the best comparison is probably ocean thermal energy conversion. The very good news is that the conception and early tests are pretty much in the desired time frame, so somebody coming up with the idea of adapting it to a desert would be viable. Thermal labyrinths are ancient technology and heat engines were largely invented during the 19th century, so that all works as well. The good news is that OTEC has been tested and it does actually work, so the desert version would probably as well. How well is bit hard to say since the working fluids and many other details differ. The differences kind of balance out but you'd have to do actual numbers to know how well and that would require an actual design. Maybe an actual physical experiment at significant scale even. The bad news is that OTEC never has made a breakthrough. It never really succeeded in competing with coal and oil. And the desert version would probably be more problematic. While this proposal basically uses the entire desert for capturing the solar energy and so solves some of the density problems of other types of solar power, it still cannot compete with coal on density and thermal labyrinth would be more upfront work than pumping up cold sea water as in OTEC. So the economic potential would be limited. That said in this time frame cheap labor might be more accessible than imported fuels. Or the government might simply worry about being dependent on imported coal in case of a war. Or about maintaining the logistics of transporting the fuel. And there are uses other than electricity where this might work better. This system already pumps both cold and hot air, so it would only need some valves and thermostats to give you a self powered air conditioning system. In a hot desert that is not nothing. Likewise something like irrigation by pumping up ground water would be better fit than electricity generation. A farmer might be happier with spending time to build a thermal labyrinth than with spending money to buy coal or oil and intermittent and low density works fine for irrigation. So the actual answer would be split. Utilize, yes. Replace coal, no. 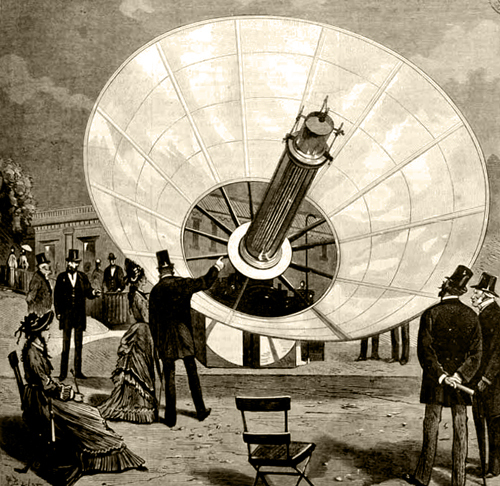 A Frenchman named Augustan Mouchot demonstrated solar powered steam engines in 1866. Sadly for the inventor, coal was and is far cheaper especially since it can be burned 24/7 for power when you need it. There is another viable alternative for coal which was in use during the 19th Century which you've already confirmed exists within your question; rivers. Many machines of this period were powered by water wheels. If they have rivers and an ocean, there is no need to reinvent the wheel by creating some sort of elaborate solar powered system. This would meet the second part of your question; replace coal in some other way. Your people could use wood gas. Wood gas is a syngas fuel which can be used as a fuel for furnaces, stoves and vehicles in place of gasoline, diesel or other fuels. During the production process biomass or other carbon-containing materials are gasified within the oxygen-limited environment of a wood gas generator to produce hydrogen and carbon monoxide. These gases can then be burnt as a fuel within an oxygen rich environment to produce carbon dioxide, water and heat. 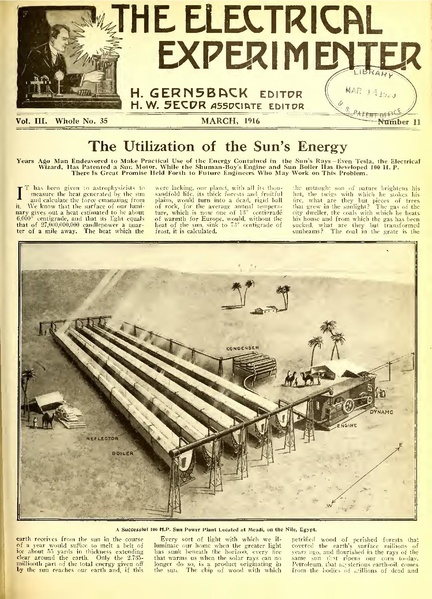 Your people would be using solar power (as per OP) because they would grow crops to use as feedstock for the gasifier - maybe canary grass or tamarisks or whatever hardy plant they can grow in the harsh lands where they live. Or maybe they have ag waste from whatever they grow as food. Or river weeds. Wood gasifiers are actually quite omnivorous - wood is fine and so is grass, rubber, dung, dead fish or anything with carbon in it. Anything you can do with natural gas you can do with wood gas. You already have some good ideas of things they could have used. Optics with big lens or mirror to boil water and connect steam engine to electric generator for example. Modern solar power In terms of PhotoVoltaics (PV panels as we have on houses, camper vans et.c.) it would probably not have been possible as the photoelectric effect was understood just at start of 1900s. In fact in the very same famous paper that gave Einstein the Nobel prize. I'm not even going to try to compete with Chuck Ramirez's superbly researched answer, but nobody has yet mentioned the Stirling Engine which dates back to the early 1800s and was far more efficient than primitive steam turbines. It's also a perfect match to concentrated solar power: just use that to heat the "hot end". 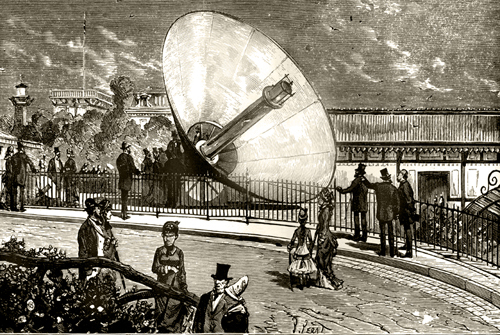 The problems with tracking the sun using clockwork and cams mentioned in other answers would remain to be solved. There was a company trying to develop Stirling engines mounted at the focus of parabolic dishes for direct generation of power (IIRC in the 1990s). There were problems getting the oil lubrication of the engine to work at all possible orientations, and then the whole concept got overtaken by solid-state solar panels. Although it might still be more efficient, area-for-area. Sterling engines can be over 40% efficient, a mirror better than 90%. Not the answer you're looking for? 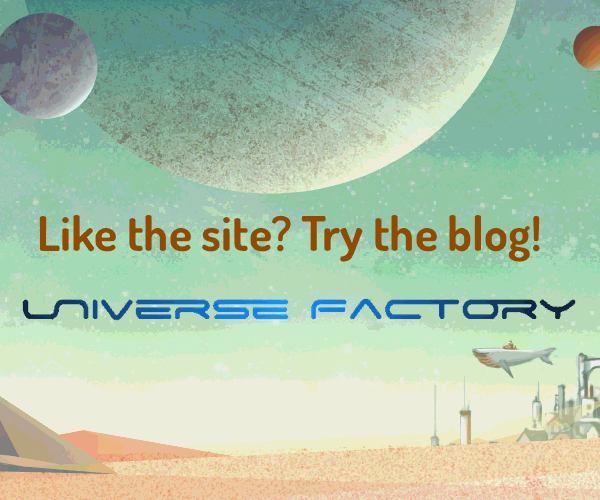 Browse other questions tagged technology hard-science steampunk or ask your own question. Could a 19th century setting support horse-propelled non-steampunk tanks? Could a 19th century space gun be of any use today in space exploration? What would the industrial age be like without oil and coal? What would a steam locomotive look like if steam power became yet again the main type used in rail transportation? How to combat magic as science? Could people of the 14th century create an inline engine for use in aircraft and vehicles?